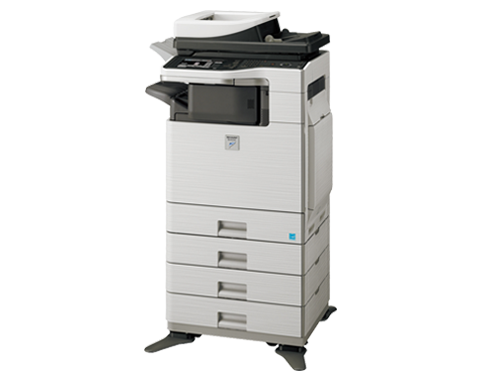 Multifunction printers combine print, fax, scan and copy capabilities into one machine. The Sharp MX-B402 is Energy Star-rated, offering even more savings. The Sharp MX-B402 has a refillable developer system, which doubles the lifespan of your toner to 20,000 pages. Don’t worry: The refillable developer system does not affect the print quality of your images. This printer also provides the option of reducing dpi (dots per inch) to save on ink expenditures. Greater lifespan for toner and ink means less time the printer is offline. With the Sharp MX-B402, you can send and receive faxes via email, greatly reducing paper waste. Faxes and scanned documents can be distributed electronically from personal workstations, saving your office valuable time. ImageSEND technology sends scanned documents to up to 7 destinations. The Sharp MX-B402 features impressive printing speeds of 40 ppm and an easy-to-use document filing system with thumbnail preview. Documents are available quickly: No more time wasted tracking down important files. The large touch-panel and intuitive user interface make this Sharp multifunction printer a breeze to operate. At Pacific Office Automation, we are committed to helping our customers cut costs, improve efficiency and keep excess waste out of landfills. That’s why we offer Energy Star-rated Sharp printers. Contact us today for a free workflow analysis. We can help you find the best office printer for your needs!